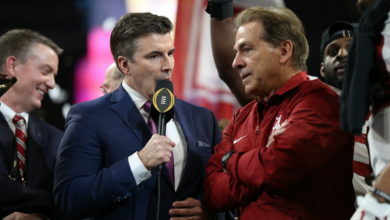 ESPN Set for Two Weekly Docuseries in 2019 – The American Game and The Greatest – as Pillars of Network’s College Football 150 Initiative - ESPN Press Room U.S.
With the 150th anniversary of college football arriving in 2019, ESPN is embarking on a year-long, multi-platform storytelling experience that was initially announced in August 2017. As part of the initiative, two weekly documentary series will be launched, with both capturing the pageantry and passion of a sport that is an American institution. Collectively, The American Game will be a definitive look at the history of college football as not just a sport, but as a cultural phenomenon as well. Ranking the all-time best uniforms, rivalry games, voices, and “What Ifs?” among other subjects, this 11-episode series will feature a wide range of Top 11 lists (it is football, after all) spanning the history of the sport. However, The Greatest is about more than rankings, with each episode’s countdown serving as the foundation for storytelling focused on the memories, breakthroughs, and personalities that have defined college football’s remarkable history. Making the choices for each list is an 11-member ESPN jury, who will debate and discuss the candidates before revealing their verdict. The American Game and The Greatest are both being produced by Herzog & Company, the Emmy Award-winning production company which has produced critically acclaimed original programming for network, cable and digital outlets. Recognized most recently for their Emmy-nominated Decades series for CNN (The Sixties, Seventies, Eighties, Nineties and 2000s) and The History of Comedy, Herzog is currently in production on The Movies, a 12-hour documentary series for CNN produced in partnership with Gary Goetzman and Tom Hanks (Playtone), Cola Wars, a 2-hour documentary exploring the historic rivalry between Coke and Pepsi for History Channel, and the true crime documentary special Dirty John: The Dirty Truth for Oxygen which is based on the explosive L.A. Times podcast and newspaper articles. Mark Herzog is also an Executive Producer on the 8-hour scripted series Dirty John that premieres November 25 on Bravo. This is the first in a series of announcements about specific plans for the ESPN College Football 150 initiative, which will begin on January 2, 2019 primarily on ESPN’s digital and social platforms.